Pioneers in the industry, we offer carton tapping sealing machine from India. 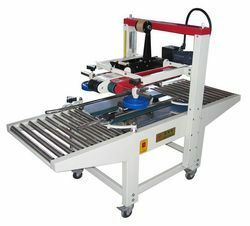 semi auto Carton Sealing Machines Model CTM 600 - mainly used in the sealing and packing of cartons which can be used either independently or as a necessary apparatus to a production line, It is widely used in the field of electrical domestic appliances, textiles, foodstuffs, general merchandise, medicine and chemical industries. Optional casters locking/swivel with inkjet printer (FXJ6050A). Width of adhesive tape: 1, 1.5, 2,2.5"